COLUMBUS — Cornhusker Public Power District is looking into potential renewable energy sources to provide a portion of its electricity. The district’s board of directors recently authorized a study with Omaha-based Bluestem Energy Solutions that will determine the feasibility of both wind and solar projects within Cornhusker’s service area . . . Under its wholesale power agreement with Nebraska Public Power District, Cornhusker could purchase up to 10 percent of its electricity from renewable energy sources. Click to read more. 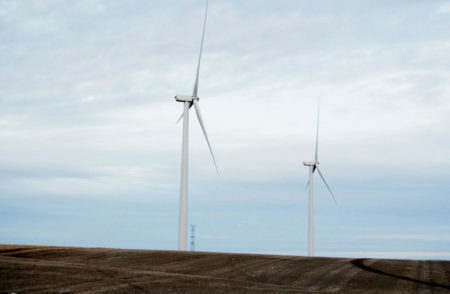 Telegram file photo: Wind turbines rise from the countryside about 4 miles southwest of Creston, where Creston Ridge Wind Farm was built last year. This entry was posted in Nebraska / Midwest News, NewsBlog and tagged Columbus Telegram, Cornhusker Public Power District, Creston Ridge Wind Farm, Loup Public Power District, Nebraska Public Power District (NPPD), Omaha-based Bluestem Energy Solutions, renewable energy planning & development in Nebraska on September 30, 2016 by Helen Deffenbacher.